With qualifiers in 11 events for this weekend’s California state championship track and field meet at Buchanan High School in Clovis, the Grossmont Conference might also want to borrow that tag line. It is a noteworthy number for one of high school track and field’s biggest championship events. 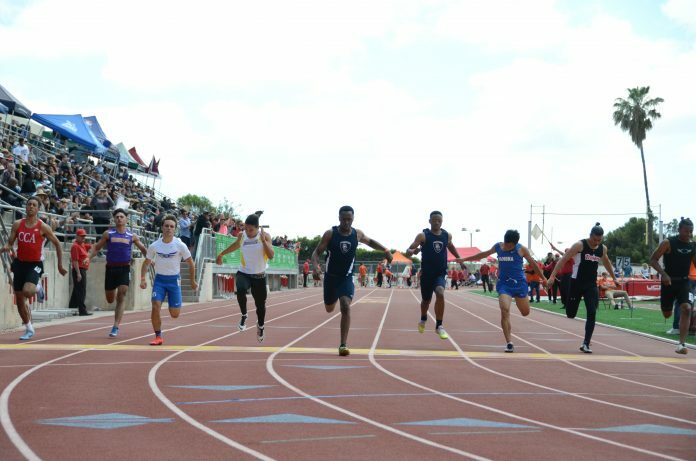 It all will unfold with the state prelims Friday, June 1, followed by the state finals on Saturday, June 2. A live stream can be accessed through www.cifstate.org. Highlighting the parade of East County qualifiers are the San Diego Section champion Helix boys 4×400 rely team and a pair of student-athletes who qualified in two individual events: West Hills freshman Brandy Atuatasi in the shot put and discus throw and Granite Hills senior hurdler Dylan Coleman. Athletes qualified for this weekend’s state meet through marks earned at last Saturday’s San Diego Section championship meet at Mt. Carmel High School. The top nine place-finishers from the preceding prelim meet qualified to compete in A-heats at the section finals while the next nine place-finishers from the prelim meet qualified to compete in B-heats. The top three place-finishers in the A-heats qualified to compete at the state meet. However, athletes in both the A-heats and B-heats competed for place-finishes in the Division I and Division II finals. The weather conditions were perfect for competition, and the field did not disappoint. 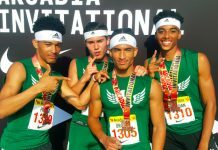 The Helix foursome of junior Ty Sheridan and sophomores Gabriel Martinez, Nic White and Eric Parker timed a section-best 3:21.86 to win the A-heat in the boys meet-ending 4×400-meter relay. The Highlanders pulled away in the final 100 meters to top runner-up Mt. Carmel (3:21.87) and third place Olympian (3:23.09). The Highlanders’ winning unit was quick to note that it is not done. “We have one more year together,” Parker said enthusiastically. Parker is also not done this season after qualifying to compete in Friday’s state prelims in the 400-meter dash after recording the third-place time of 49.11 seconds (a season best) in the A-heat. Mira Mesa junior Marcus Dean finished first in the A-heat with a time of 48.37, followed by Calvin Christian junior Wesley Salzman in 48.43. Dean finished as the Division I champion while Salzman earned honors as the Division II champion. Parker finished runner-up among section Division I quarter-milers. Atuatasi finished runner-up in both the A-heat shot put (39-3) and discus throw (135-0) to emerge as the Division II champion in both events. Atuatasi’s older sister Briana, a Wolfpack senior, took fifth in the shot put. The sister dynamic has been fun to watch this season, said head coach Juan Naranjo, and it has had a positive influence on the team. Naranjo said he expected to have a strong season with his sprinters, but Brandy’s performance on the team this year as a freshman was unexpected. Atuatasi’s teammate Jordan Earl took third in the 100 meter (12.20) in Division I.
El Camino senior Nu’u Tuilefano recorded the top section marks in both the shot put (40-2) and discus throw (139-8) as the Division I champion. There were plenty of top marks to spread around among East County athletes. Granite Hills senior David Leber recorded the top mark at last Saturday’s section finals in the boys discus throw (165-0) while teammate David Gonzalez finished runner-up in the boys shot put (a season best 54-2). Both throwers claimed the Division I title in their respective events. Leber, the regular season section leader with a 171-2 mark, out-threw runner-up Shawn Poma (155-10), a junior from Cathedral Catholic, to win the event. Gonzalez finished second behind section champion David Folsom, a senior from Point Loma, who recorded a put of 55-10. Southwest El Centro senior Alexis Paco de la Cruz finished third with a mark of 54-0. Three proved to be the magic number for Granite Hills’ Coleman after his third-place times in both the 110-meter high hurdles (a personal record 14.63) and 300-meter intermediate hurdles (39.02) allowed him to punch his ticket to the state meet. He finished as the Division I runner-up in the high hurdles and the Division I bronze medalist in the intermediate hurdles. This marks the first time he has qualified for the state meet. Valley Center senior Jeremy Clay turned in the top time at the section 110 high hurdles finals in 14.29 while El Centro Southwest senior Tyler Saikhon, the regular season section leader in the event, finished second in 14.36. Both times were personal bests. In fact, the top four finishers in the race all turned in personal bests. Coleman clipped Tri-City Christian senior Eric Wojnowski (14.77) by 0.14 seconds to secure the final state-qualifying berth. Coleman set a personal record with a time of 38.88 in the 300 intermediate hurdles at the preceding section prelim meet. He finished behind Rancho Bernardo senior Joshua Farmer (37.81) and Saikhon (38.75) at the section finals. The event was highly competitive as six of the eight hurdlers in the A-heat finished under the 40.00 mark. Valhalla’s Lieu finished fourth in 39.55, followed by El Capitan senior Dylan Burke in fifth place in 39.72 and Grossmont junior Leyikun Solomon in sixth place in 39.89. Burke finished as the Division II champion in the event. Coleman also competed in the A-heat boys high jump, clearing 6-2 to tie for fifth in the state-qualifying field and third overall among Division I jumpers. 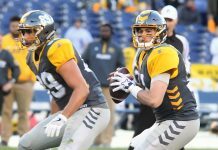 His best on the season is 6-6, which tied for the regular season top mark. Sage Creek senior John Walther cleared 6-6 to win the event at the section finals. Mt. Miguel senior Kiara Harrison (18-7.5) and Steele Canyon senior Mya Cross (18-5) were among five section state qualifiers in the girls long jump, including the three automatic qualifiers and two additional jumpers who met the state qualifying standard. Harrison finished as the Division II runner-up while Scott finished as the Division I runner-up in the event. Both notched season bests on the day. Meanwhile, the Steele Canyon foursome of Jordan Anderson, Cullin Paisley, Javon Woodbridge-Mason and Marvin James Jr. finished second among section teams in the meet-opening boys 4×100 relay with a time of 41.91 to qualify for the upcoming state meet. The Cougars finished a mere 0.01 seconds behind section champion St. Augustine (41.90) in a photo finish. St. Augustine finished as the Division II champion in the event while Steele Canyon finished as the Division I champion. Both times rank first and second, respectively, in the section on the season. Steele Canyon finished third in the Division I boys team standings with 53 points, followed by Granite Hills in fourth place with 45 points. West Hills finished fourth in the Division II girls team standings with 49 points. 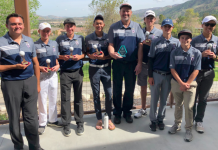 Team champions included Rancho Bernardo (Division I boys), Cathedral Catholic (Division II boys), Torrey Pines (Division I girls) and Coronado (Division II girls).